Decades before graphic novels and short stories for adult audiences gained popularity in the United States, Yoshihiro Tatsumi founded the genre in his native Japan. Beginning in the 1950s, he created "gekiga," meaning "dramatic pictures." Writing and illustrating these tales when the defeat in World War II was still fresh in most Japanese people's minds, Tatsumi began telling stories of ordinary people suffering quietly in urban settings such as Tokyo. Usually unable to express their psychological fears and needs verbally, these characters find release in unusual, bizarre, and even dangerous ways. Accompanying his stories with illustrations that range from the highly detailed and realistic to the expressionistic, Tatsumi has found a niche outside the mainstream while still gaining a large and respectful fan base. It was not until 2005, however, that his translated collection The Push Man, and Other Stories won him attention in North America. A young boy during World War II, Tatsumi was the son of parents who ran a laundry business. The family was so poor that the young Tatsumi attended school irregularly because education had to be paid for at the time. He found comfort in comic books, which could be read in rental book stores in which customers could pay a small hourly fee and read as many comics in that time as they wished. Becoming a fan of comic book artist Tezuka Osamu, Tatsumi learned that the artist lived close by. He visited Tezuka, who took the teenager under his wing and gave him encouragement. Eventually, Tatsumi found work with rental shop company Hinomaru Publishing in his home of Osaka, but as the economy improved in Japan and comic books and paperbacks became more affordable, the rental industry collapsed. Tatsumi left Osaka for Tokyo in 1957, where he and some of his friends started creating comics in the gekiga style. American graphic novelist Adrian Tomine is responsible for editing and designing the collections of Tatsumi's works that have reached America. The Push Man, and Other Stories contains tales originally published in Japan in 1969, and Abandon the Old in Tokyo 's stories are from the following year. Yet, critics have repeatedly noted that they read in many ways like modern compositions. 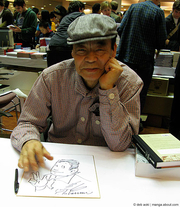 Yoshihiro Tatsumi is currently considered a "single author." If one or more works are by a distinct, homonymous authors, go ahead and split the author. Yoshihiro Tatsumi is composed of 4 names. You can examine and separate out names.